Converting an electric air compressor to a gas engine-powered compressor involves replacing an electric motor with a gas engine. This is usually done to increase the portability of the air compressor. A portable air compressor is useful for painters who use air-painting equipment. Adding a gas engine also lowers the weight of the overall air compressor. This weight reduction adds to increased portability. The conversion process requires both time and ingenuity. Identify the horsepower rating of the electric motor by checking the nameplate or motor documentation. The horsepower of the gas engine must be equal to or greater than the horsepower of the electric motor. Choose a pulley that is the same size as the electric motor pulley. Ensure the new pulley's shaft diameter is sized to fit the shaft on the gas engine. Shut off the power to the electric motor at the main power panel. Use the socket wrenches to remove the electric motor. 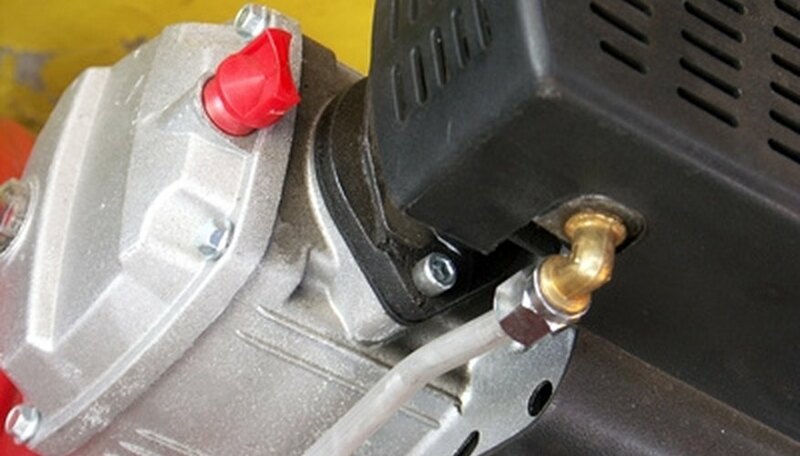 Place the gas engine on top of the electric motor mount on the compressor. Align the pulley of the compressor with the pulley on the gas engine. Use a marker to mark the location of the new mounting holes. Set the gas engine aside and drill four new mounting holes in the motor mount of the compressor. Do not drill through the compressor tank. Set the motor back onto the mounting area and bolt it down, using new bolts. Tighten the bolts with a socket wrench. Install a new belt between the two pulleys. You may need a different sized belt depending on where the new pulley sits in relation to the location of the old pulley. Locate the existing blowoff valve on the compressor. The blowoff valve is designed to shut off power to the electric motor when the compressor tank is full. Ground the spark plug wire or the ignition circuit to shut off the engine by connecting the blowoff valve switch wire to the engine's kill switch.